Acquiring the skills of laparoscopic suturing and knotting techniques can be considered a prerequisite to learn advanced laparoscopic procedures. Despite the concept that developing such skills should be reserved for the younger generation of surgeons due to the high level of difficulty in manual skills involved, this has not been the authors’ experience in training surgeons. 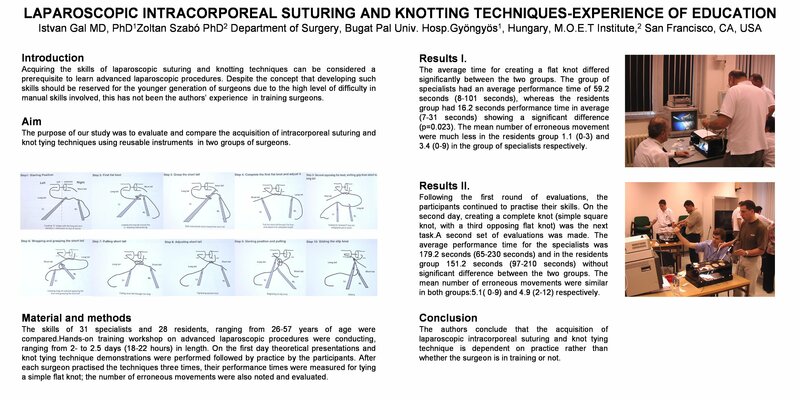 The purpose of our study was to evaluate and compare the acquisition of intracorporeal suturing and knot tying techniques using reusable instruments in two groups of surgeons. The skills of 31specialists and 28 residents, ranging from 26-57years of age were compared. Hands-on training workshops on advanced laparoscopic procedures were conducting,ranging from 2 to 2.5 days (18-22 hours) in length.On the first day theoretical presentations and knot tying technique demonstrations were performed, followed by practice by the participants. After each surgeon had practiced the techniques three times, their performance times were measured for tying a simple flat knot; the number of erroneous movements were also noted and evaluated. The average time for creating a flat knot differed significantly between the two groups. The group of specialists had an average performance time of 59.2 sec. (8-101seconds), whereas the residents group had 16.2 sec. performance time in average(7-31 seconds) showing a significant difference (p=0.023).The mean number of erroneous movements were much less in the residents’ group 1.1(0-3) and 3.4(0-9) in the group of specialists respectively. Following the first round of evaluations, the participants continued to practice their skills. On the second day, creating a complete knot( simple square knot, with a third opposing flat knot) was the next task. A second set of evaluation was made. The average performance time for the specialists was 179.2 sec. (65-230 seconds) and in the residents group 151.2 sec. (97-210 seconds) without significant difference between the two groups.The mean number of erroneous movements were similar in both groups:5.1(0-9) and 4.9(2-12) respectively. The authors conclude that the acquisition of laparoscopic intracorporeal suturing and knot tying technique is dependent on practice rather than whether the surgeon is in training or not.